Mamo was my great grandmother on my mother's side. She died when I was pretty young, but in the few memories I have of her, she is always wearing an apron. Mamo was a good cook and I'm sure she would be proud to know that some of her recipes have become family favorites and part of our holiday traditions. That's definitely the case with her butterscotch pie. 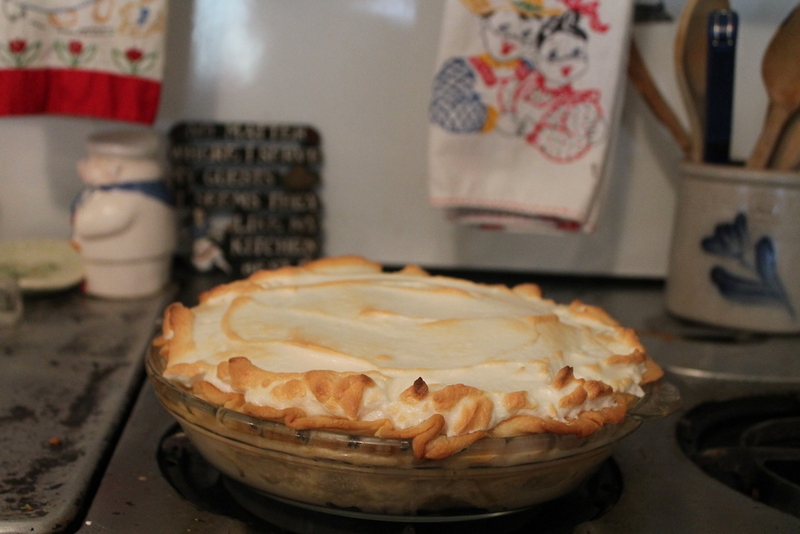 If it's Thanksgiving, there better be at least one butterscotch pie. This is the real deal, from scratch, but don't be intimidated because if you can measure and stir, you can make this pie. In a sauce pan, heat the brown sugar, milk, egg yolks, and vanilla until bubbling. In a small bowl, mix the cornstarch with a little water until dissolved and add to the mixture in the sauce pan, stirring until it thickens. Now add the butter and mix well. Pour the mixture into the prepared pie shell. December 6, 2012 by Lynn Adams.